I was so excited to hear that my Treasured Visits layout won the June monthly kit challenge at my local scrapbook store, Our Paper Place! I got a $20 gift card for some fun new products and I’ll be attending a crop there soon. Posted in Accomplishments | Comments Off on An Accomplishment! These are a series of photos I’ve kept of my boys being cute. The kitties like to pile on top of Warren for some love. Details: Brown paper (pattern is metallic) is by Chatter Box Artsy.licious. Orange/blue/green patterned paper is by Basic Grey Marrakech. Black squiggle vertical stripe is by Basic Grey Just the Edge Cardstock. Green paper button is by Creative Memories. 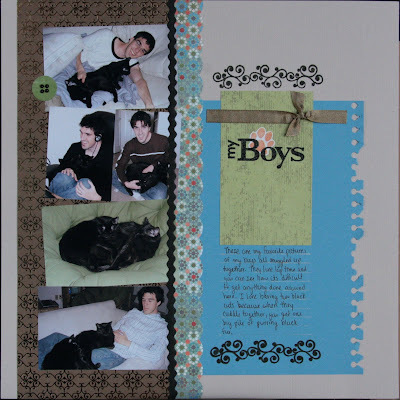 “my Boys” was written with Making Memories glitter alpha stickers.